The Preview Pane is a live preview window displaying the particle system represented in the Effects Chain. When changes are made to the settings or Blocks, the preview will update to represent those changes. When you select an effect preset from the Presets pane, the name of that preset will appear at the bottom of the Effects Chain. If you alter any of the blocks in the effects chain the name will change to "Untitled" until it is saved as a custom preset. 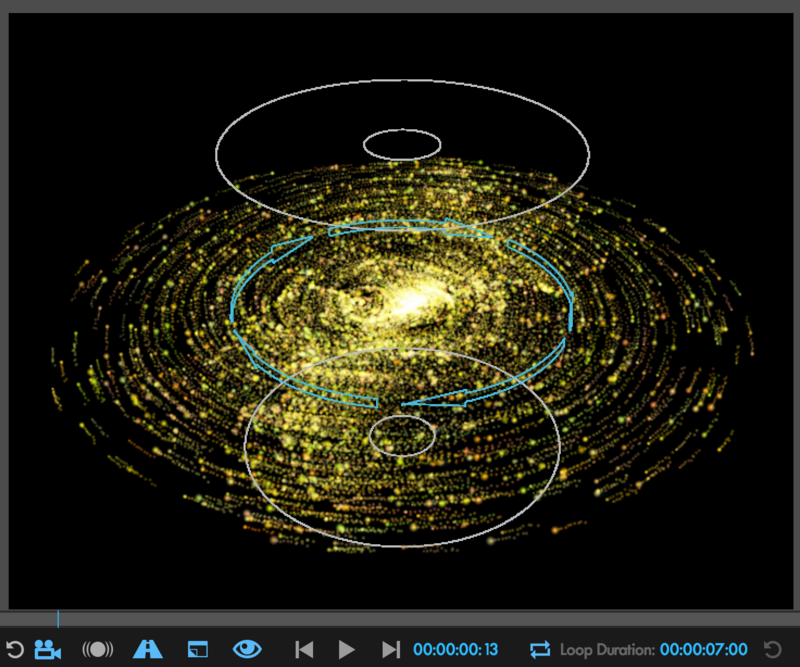 The Preview pane displays your particle system on a loop set to the length of your composition. Use the spacebar to start and stop the playback. You can also simulate changing the X/Y positions of the emitter by holding down the mouse while clicking and dragging within the preview window. Previewing complex particle simulations can be taxing on computer hardware. Using your GPU to accelerate previews can often speed things up quite a bit. To enable GPU acceleration in the Designer, click the sprocket icon at the bottom of the Designer. This opens up the Preferences for the Designer. Here you can choose how to accelerate your speed, using either CPU (the computer) or the GPU (the graphics card). Occasionally, acceleration with the GPU might yield unexpected results. But in many cases, accelerating previews with the GPU is much faster. When choosing GPU, there are two options, Direct and Streaming. Direct is more accurate but does not offer as much of a speed increase. Streaming delivers significantly increased speed in most cases, at the cost of accuracy. Note that these options only enable GPU acceleration for the Designer. 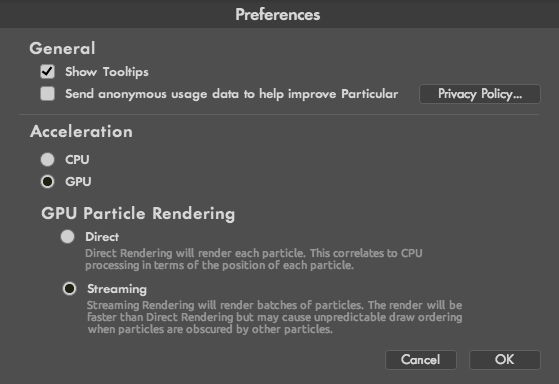 To enable GPU acceleration for your particles back in After Effects, you will need to enable it there as well. For more information on that, see the Rendering Group page. Controls at the bottom of the Preview Pane affect the Camera, Render, and Playback of your preview. These changes are only affecting your Designer preview, no settings from these controls are round-tripped back to After Effects. The Comp Reset button will reset any adjustments made using Camera Preview Mode, causing the view to return to the settings from the composition. 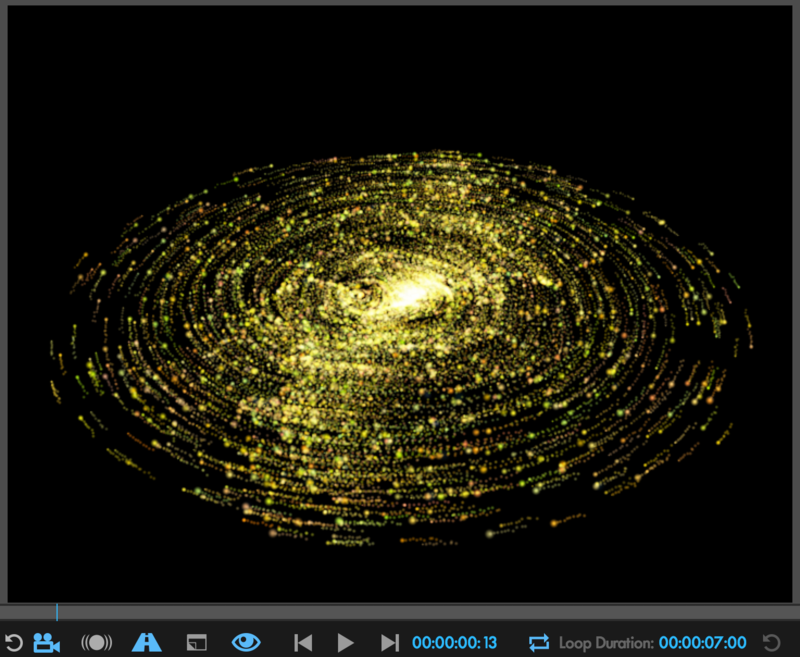 Note that these view changes are only temporary and are not roundtripped back to After Effects. To reset the view changes you make, click the Comp Reset button. To actually change the angle or position of your form, adjust the Emitter position, World Transform, or use an After Effects camera. The Motion Blur button allows you to preview motion blur in the Designer. The Depth of Field button allows you to preview depth of field in the Designer. This option does not create a depth of field. It only allows you to preview the depth of field that you’ve created in After Effects. In order to create a depth of field, there must be a camera in your composition with Depth of Field enabled. The Overlays button hides or shows any diagrams or visualized fields applicable to whatever parameters you're currently trying to control. Top and bottom, the viewer with overlays enabled and disabled. The Full Render button renders the form particles normally when enabled. When deselected, “beauty” adjustments like Size/Opacity Randomness, Blend Mode, Depth of Field, etc. that primarily affect the visual attributes of the particles are disabled. This mode is helpful to get a clearer idea of how your particles are behaving. Along the bottom of the Designer Preview is a progress bar showing where in your animation the preview is currently at, as well as the render progress when changes are made. You can control the position and behavior of this playhead using the controls outlined below. The First Frame button takes your Preview Pane to the first frame of the preview's animation. The Pause button pauses your Preview Pane on the current frame shown in the preview's animation. The Last Frame button takes your Preview Pane to the last frame of the preview's animation. The timecode next to the Last Frame button reflects the current timecode/frame of the preview. Click the timecode to pause playback and adjust which frame is displayed in the preview panel. The Loop Playback button enables or disables the looping of playback within the Preview panel. The Loop Duration is set to the length of your composition. 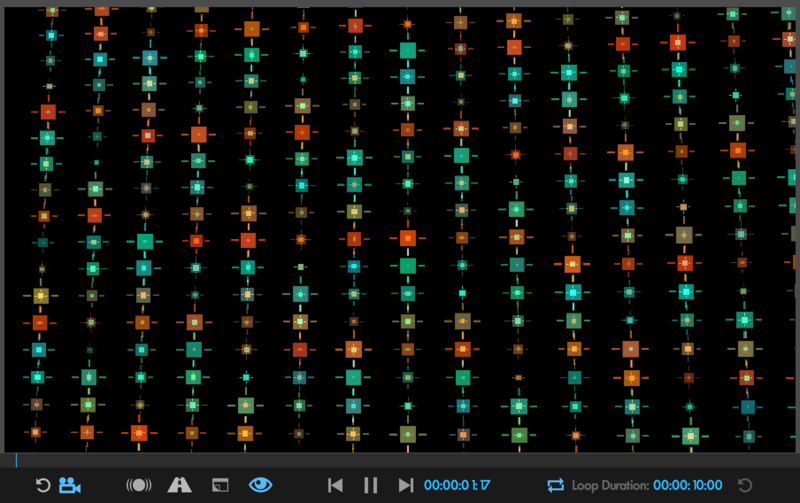 Click and enter a new duration to preview what your animation would look like at a different length. Lastly, the Reset Loop Duration button resets the Loop Duration to its default 10 second duration.